I am a front end developer by profession and an avid gamer. I play a number of PC and mobile games. My favorite genre is strategy games. 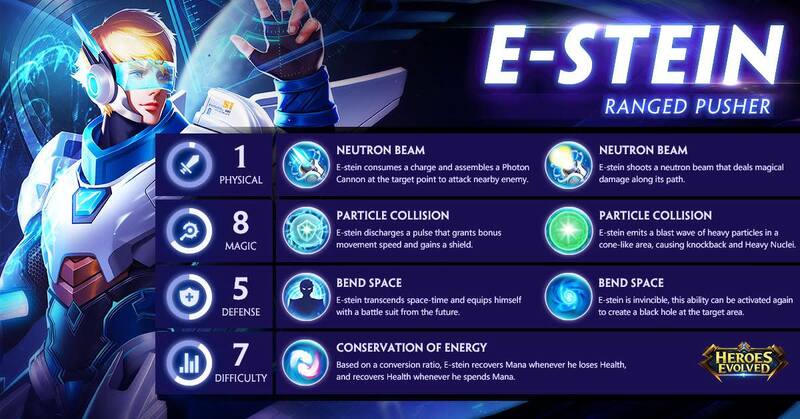 E-Stein is one of the best mages in Heroes Evolved. He has the ability to win games all on his own. He is a versatile hero who is able to adjust to any situation. He is good at defense because of his wards and ultimate which makes it almost impossible to push against. He is also good in offense due to his good team fight ability. Stein is a Nuker and Mage hero. He has a variety of high damage spells which makes him a force to be reckoned with. 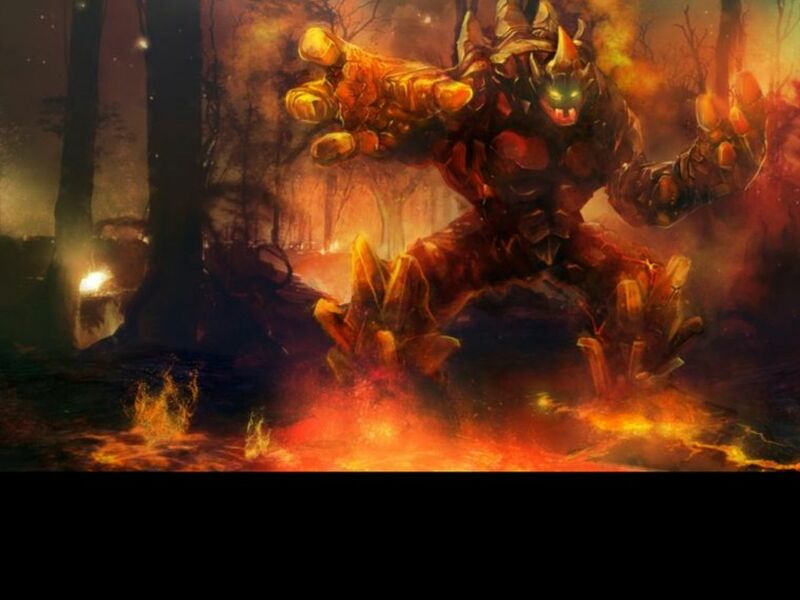 He is primarily played as a mid-lane hero due to his ability to completely dominate the lane and force the enemy out. You will also need to level up quickly as his major power spike is at level 4 when he gets his ultimate ability. 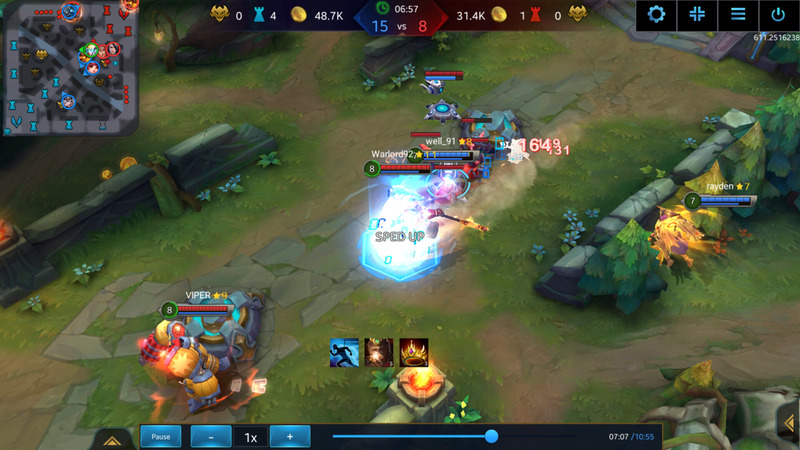 Since he is very powerful in the lane, you should try to chase the enemy hero out of the mid-lane or force rotations from other enemies to try and tackle you. Be aware that until you reach level 4 you are relatively easy to kill with zero escape mechanisms. I would suggest that you play with good vision and map awareness and there will be many gank attempts when you push the lane hard. Since you are the mid hero you should also be aware of the situation in your other lanes. It is your responsibility to teleport to any lane which is getting ganked to counter-initiate with your ultimate. 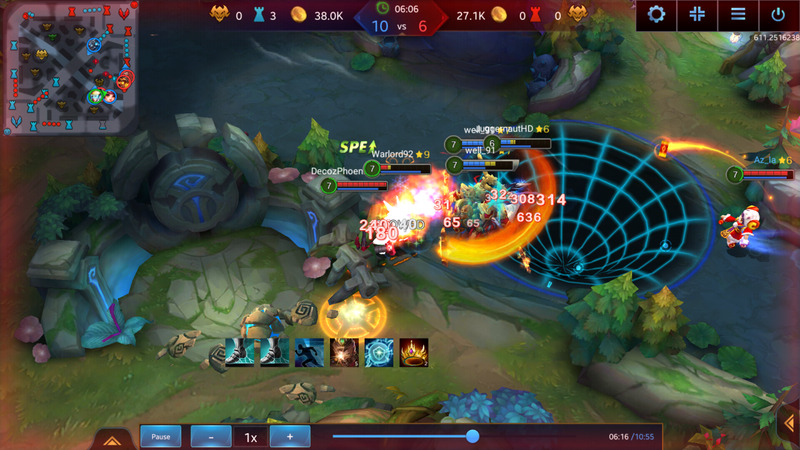 The black hole ability is excellent for team fights and helps shift the momentum of the battle. Use it wisely as your entire damage and escape mechanism is built around your ultimate. The neutron beam has 3 max charges when in present form. Once used, Stein places a photon cannon in the targeted location which then attacks targets which gets within its range. Each charge is replenished after 15 seconds. You can, however, place another cannon within 2 seconds and have a maximum of 3 cannons at any point in time. Try to place your cannons right behind where the creep waves meet to get the last hits without the risk of them being targeted by the enemy creeps of hero. 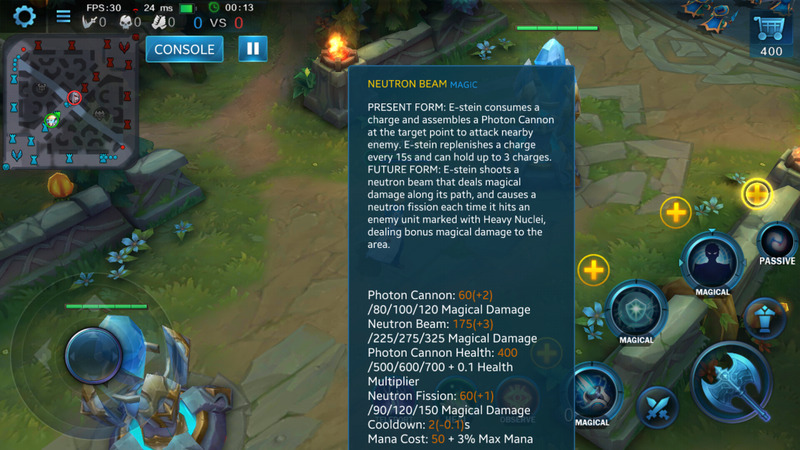 In case you are ganked, try to run around the photon cannons so that the enemy constantly gets hit (This also recovers health). 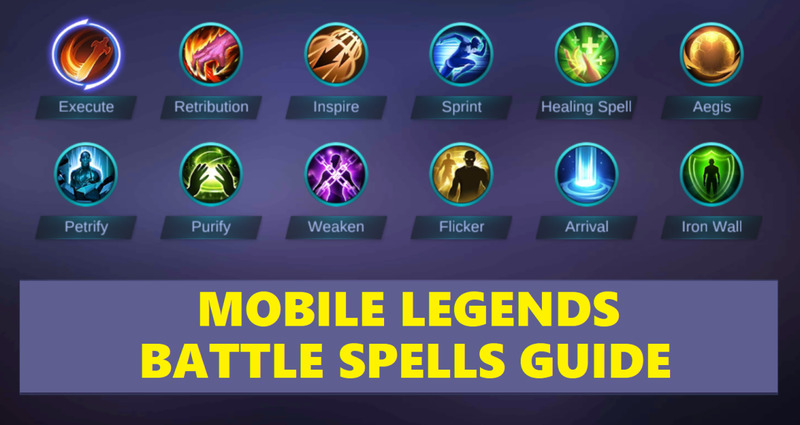 This will also be the first spell that you level up. 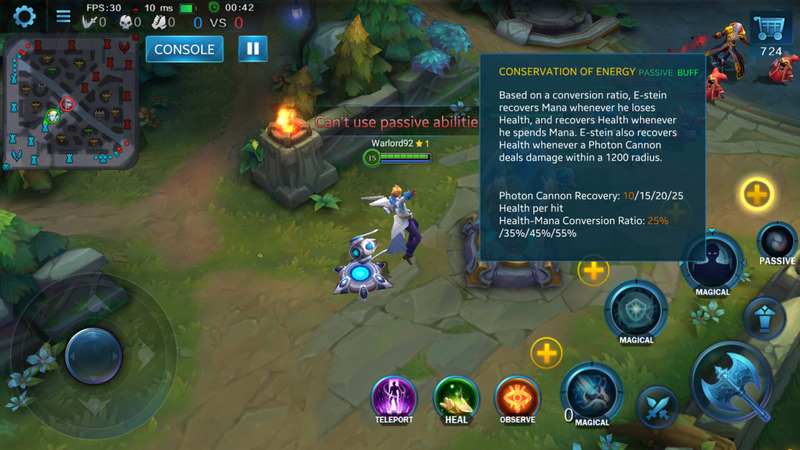 Remember that the photon cannons will only be active for a short duration after which they need to be replenished (denoted by the blue bar below their health). They will also deactivate once you are dead or move far away. Once you get your ultimate spell, Stein will now be able to enter Future form. Once in his future form, the Neutron Beam works differently. Instead of placing a cannon, Stein fires a neutron beam causing magic damage to all units in its path. This spell has a very low cooldown of just 2 seconds and deals massive damage. While Stein is in his present form, this spell provides him with a buff to his movement speed for 4 seconds. If there are any photon cannons nearby, then this also provides Stein with a shield for the same duration. You can also repair and replenish the photon cannons with this ability. Place your photon cannons behind enemy creeps and use particle collision to replenish them once they are about to die. The next attack done by the photon cannons replenished with particle collision will cause a debuff on the enemies called heavy nuclei. The unit is initially slowed for 1 second and they have to spend an additional 15% mana to cast abilities for the next 5 seconds. Heavy nuclei are also inflicted on every fourth auto attack done by Stein. 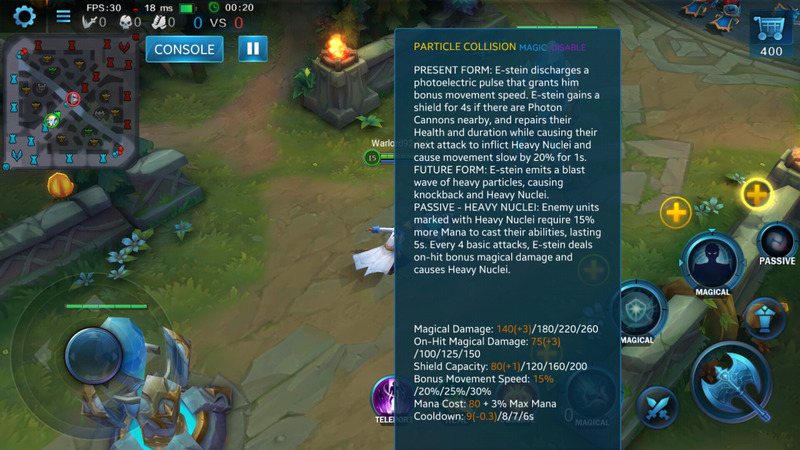 Once in his Future form, Particle collision now emits a wave of particles causing knockback and magic damage to enemy units. The enemy units hit by this wave will be affected with Heavy nuclei. This is the only spell which can be considered as an escape mechanism for Stein and is the second spell to level up. This can also be used to push enemies inside your black hole. Bend Space is the ultimate spell for E-Stein. This should always be leveled up whenever available. When cast Stein is invulnerable to any attacks or spells for 1 second and then enters future form. Once in his future form, his other abilities get changed as mentioned before. He will remain in future form for 10 seconds. While in his future form Stein can cast a black hole at a target location for 5 seconds. 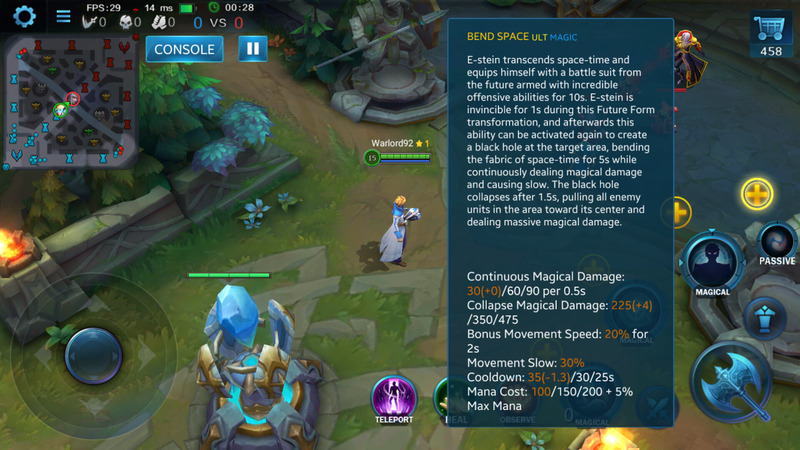 The black hole causes continuous magic damage and slowing target units. The black hole collapses after 1.5 seconds causing heavy magic damage and pulling all units to the middle of the black hole. Ensure that you are out of sight of enemy units while entering future form as it is clearly visible and the enemy might flee once they see you transform. Conservation of energy is the passive ability for Stein. Whenever Stein loses health, he recovers a portion of his mana and whenever he loses mana, he recovers a portion of his health. This will also enable you to recover health each time a photon cannon deals damage to enemies within a 1200 radius. This is the ability which is to be skilled last. 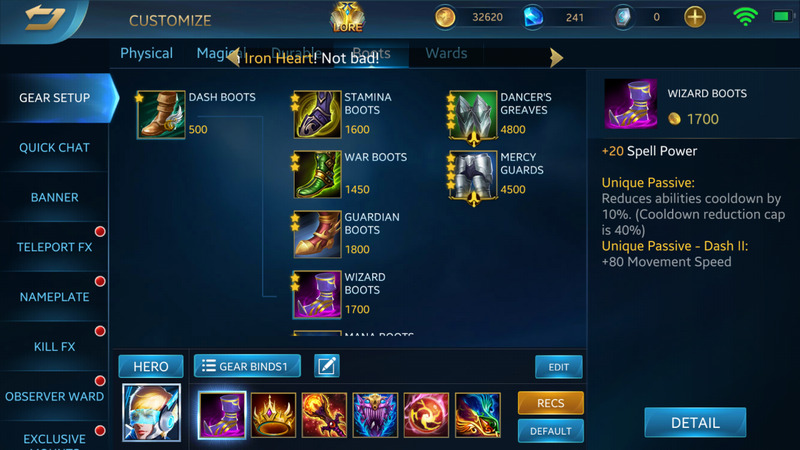 Wizard Boots – The first item for Stein is Wizard boots. This is primarily due to the fact that we need to reduce the cooldown for his spells as much as possible quickly. The boots are a cheap way of reducing cooldown by 10%. 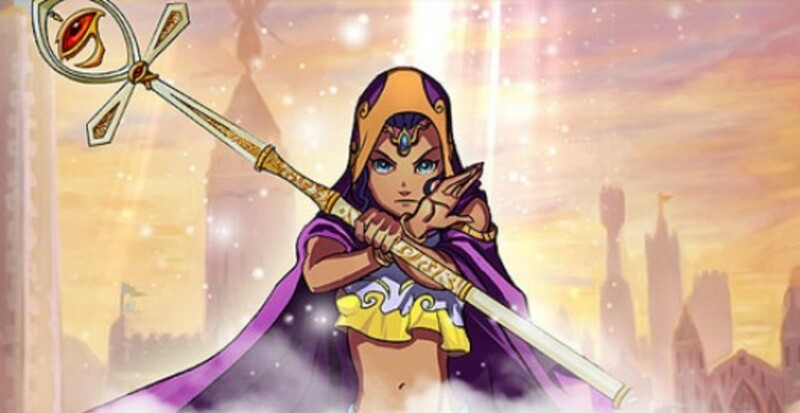 Chronos Crown – The Chronos Crown is another cheap item with very high returns. It initially provides decent health, mana, and spell power. This increases every minute and reaches its max at 5 minutes. This item needs to be purchased as quickly as possible as it scales well. Agility Wand – The agility wand is another essential item as it increases movement speed which is a problem for Stein who has very less escape potential. The 20% cooldown reduction is also excellent. Crystal Shield – The Crystal Shield is a defensive item usually built on Tanks. However, most of Stein’s damage comes from the Neutron beam which requires him to be in the middle of battle. So, this item is essential to keep him alive. Quick Pulse – Stein has an enormous magic damage output. Quick pulse provides a 15% magic life steal which means that it makes Stein even harder to kill. This is similar to how physical life steal is used on agility carries. The 20% cooldown reduction also helps, though the max reduction in cooldown is capped at 40%. Conversion Staff – The Conversion staff provides bonus 60 spell power and increases spell power by 35% which is excellent for your late game. 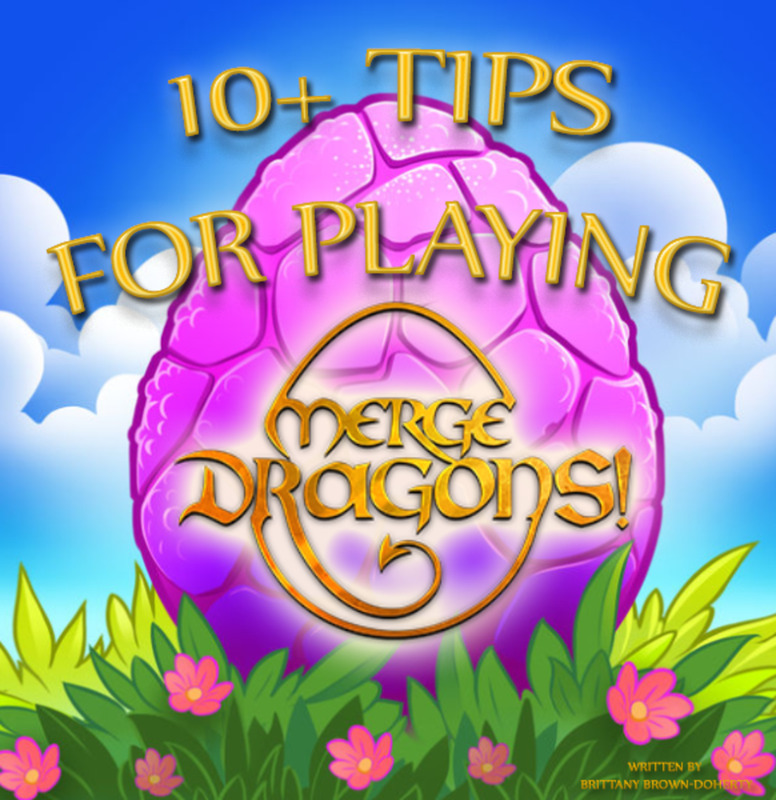 Bonus – The items mentioned here are relatively cheap and you can purchase all of them easily in a game. Once you are done buying them, you can swap out your wizard boots for Dancer’s greaves which provides an increased movement speed bonus. Stein is excellent in defending towers as he can just place his photon cannons and kill creeps before they get close. A well-placed black hole can also decimate the enemy heroes which will make them wary of pushing against him. He is also very good in team fights and at counter-initiating. He is also good against heroes which do not have a dash as they won’t be able to escape from his black hole. Stein cannot fight one-on-one with most heroes. Especially heroes which have a dash as they can easily avoid his black hole. Heroes with Control immunity or spell immunity like Gideon and Electros are straight counters for Stein. It is always better to stay away from these heroes and to fight behind your tank. Always select the Neutron Beam first. This must be leveled up as soon as you start the game as you need the charges to collect. Walk to your mid-lane instead of using your teleport as you may need it to assist your allies in case a fight breaks out. On reaching level two level up Particle collision. On reaching level three, level up your passive. On reaching level four, you can level up your ultimate and then proceed to max out your neutron beam, Particle collision and passive respectively. Place your Photon cannons behind enemy creeps as the attacks they make will hit all enemies in the target line. So, if an enemy hero stays behind the creeps, he will also get hit. 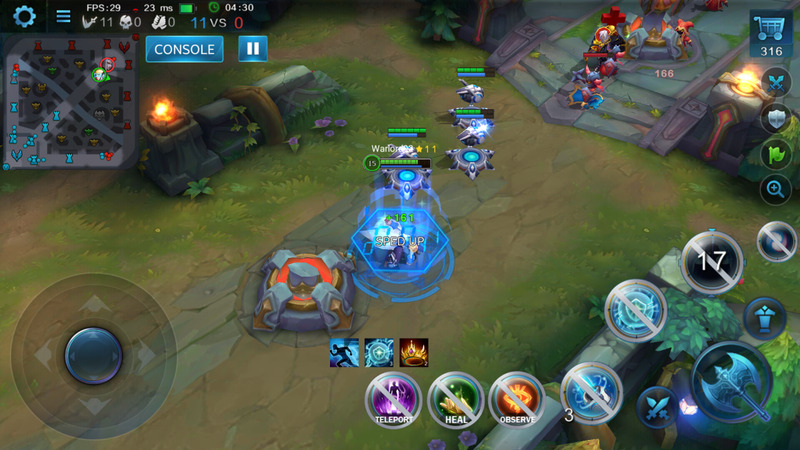 Try to position yourself between the enemy creeps and the enemy hero to prevent him from taking last hits. Do not try to fight head on versus the enemy hero but try to lure him near your photon cannons. Try to play carefully till you reach level four as you can easily be ganked. Stein is relatively weak before he gets his ultimate spell as he has no escape mechanism which makes him a prime target for enemy ganks. Play with good vision around you and watch out for missing heroes. Always take part in team fights. 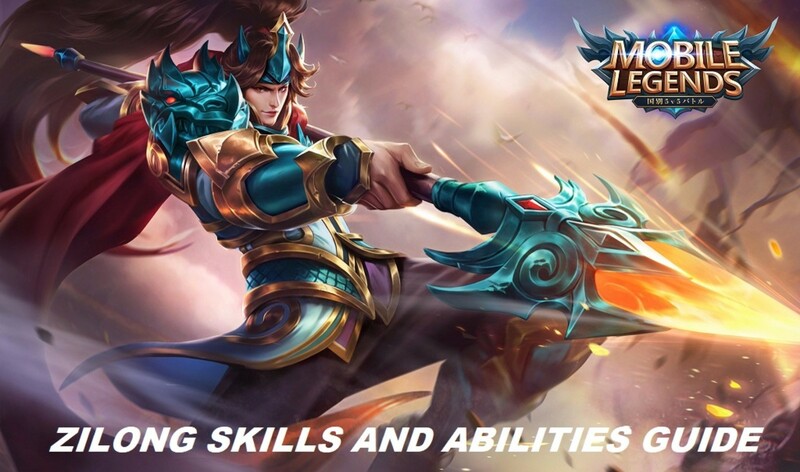 Being a mid-hero, you will be the strongest hero during the early and mid-game. Use this to your advantage and participate in every team fight possible. 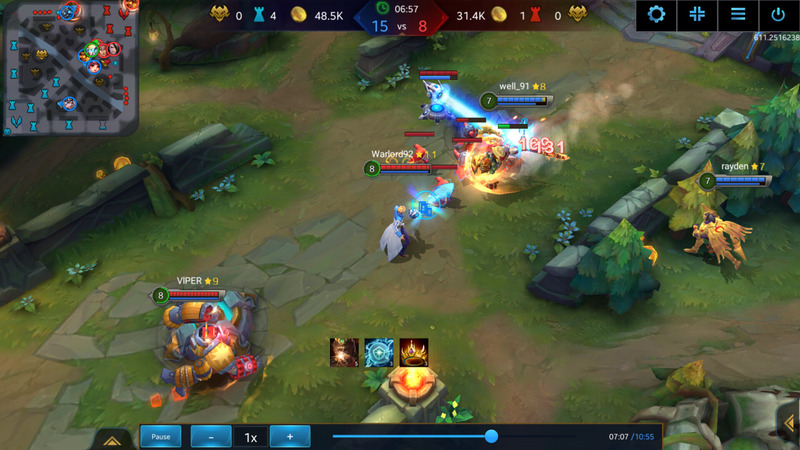 If you are able to secure early kills and get items quickly, then your role now is to steamroll over the enemies and end the game quickly. In case the enemy is dominating the game, then you need to switch to the defensive. 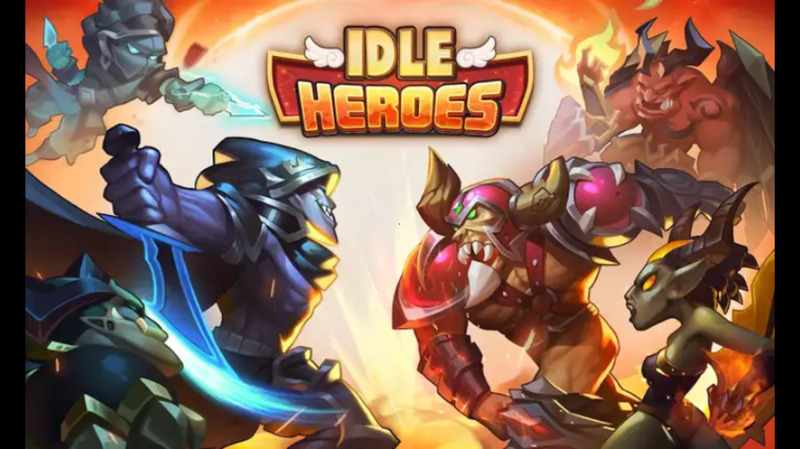 Try to defend your towers until your carry hero farms. 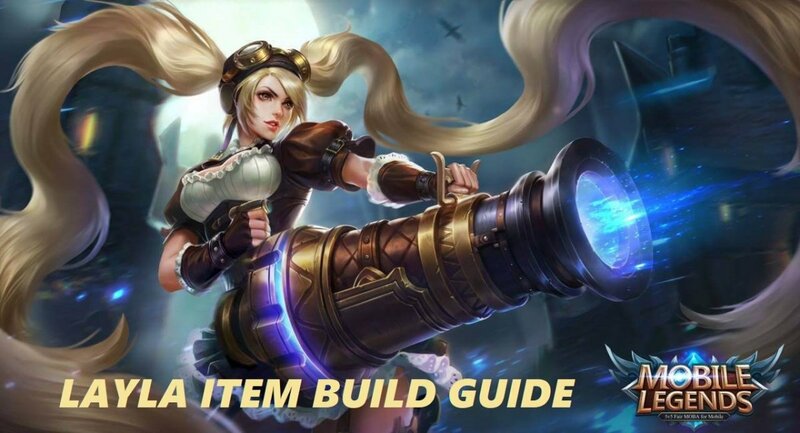 Your only role is to defend towers and prolong the game. You need to create space for your agility carries to get their items to make a comeback. Even though you might not be as powerful, you will still have good crowd control which will be enough to help your carry. There is an interesting trick which you can do with E-Stein’s ultimate. There is a one second time period when Stein is invincible during the transition to Future form. During this time, any spells or physical attacks do not do any damage to Stein. So, if you time it correctly you can avoid almost any spell. This includes Sun Wukong’s Nimbus and golden staff spells, Saya’s star of fate, Estrath’s kiss of the wind, Grom’s meat hook, etc. The timing alone needs to be perfect.